The skiing is extensive - 110km locally, with another 150km provided by the 'Arlberg Ski' pass (this gives additional access to St. Anton and St. Christoph). 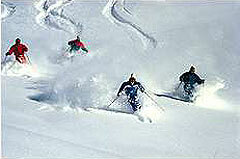 Snow reliability is superb, while the skiing is mostly for intermediates. Experts have plenty of off-piste and there are better tough runs in Zürs than Lech. Beginners have good nursery slopes, but the other terrain is challenging – Zürs is not really the best place for skiers to learn. Boarders might suggest a few improvements for the nightlife, but this is a great spot for them to learn and improve.